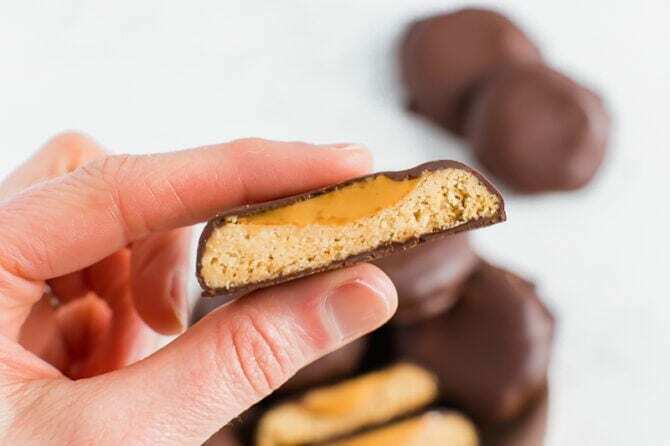 Make healthy Tagalongs at home with only 7 simple ingredients. 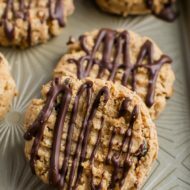 We’re using almond flour cookies, peanut butter and melted chocolate chips to create a vegan and gluten-free version of this Girl Scout classic! 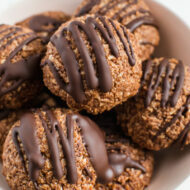 I am so dang excited to share this recipe because everyone has been obsessed with my healthy Girl Scout cookie recreations. 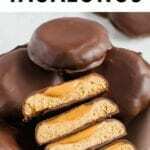 Both the 4-Ingredient Samoas and Healthier Thin Mints were a major hit so I know you’re going to love these Healthy Tagalongs. 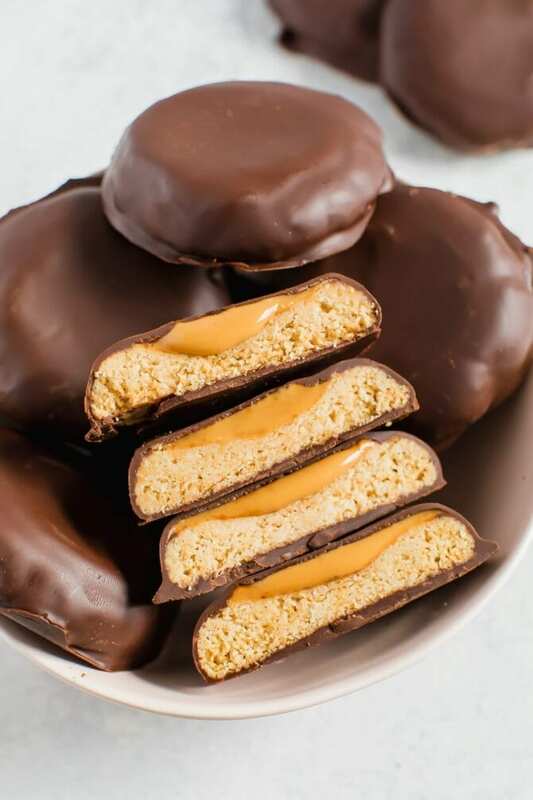 Early taste-testers have said that they’re the best Girl Scout cookie recreation yet and given my love for all things peanut butter and chocolate, they’re definitely on the top of my list too! Spreading the peanut butter + letting them harden in the fridge or freezer. Coating with rich and delicious chocolate. They’re super simple to make… the hardest part might be waiting for the cookies to bake or maybe it’s waiting for the chocolate to set… either way, the whole process doesn’t take long so before you know it you’ll be diving in to these tasty peanut butter chocolate cookies. … this list could truly go on for pages, but you get the idea. I LOVE the combination of salty peanut butter with sweet chocolate. It’s seriously a match made in heaven. I think another reason I’m obsessed with these cookies (besides the flavor) is the texture! The crunchy cookie center is soooo satisfying. Don’t get me wrong, I love protein balls that taste like cookies, but sometimes they aren’t satisfying when I’m craving the real deal. My brain can tell when I’m eating a cookie and when I’m eating a cookie-wanna-be! 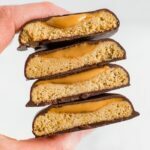 If you make these homemade healthy tagalongs be sure to leave a comment and star rating letting me know how they turned out! Your feedback is so helpful for the EBF team and other EBF readers. Add almond flour, coconut oil, maple syrup, vanilla and sea salt in a medium bowl. Scoop dough using a tablespoon and form into a round cookie shape, use your finger to create a small dent in the center of each cookie. 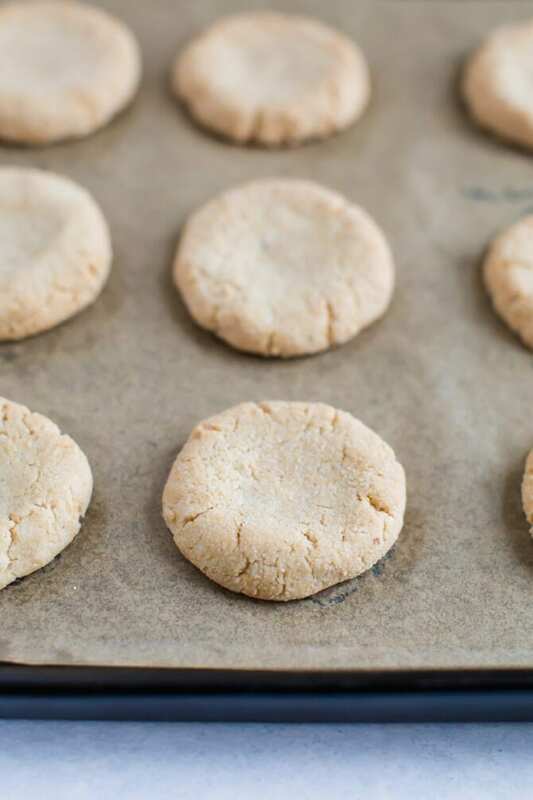 Place cookies on a parchment lined baking sheet for 15-18 minutes, until cookies are slightly golden brown on the bottom. Let cool completely on the cookie sheet. 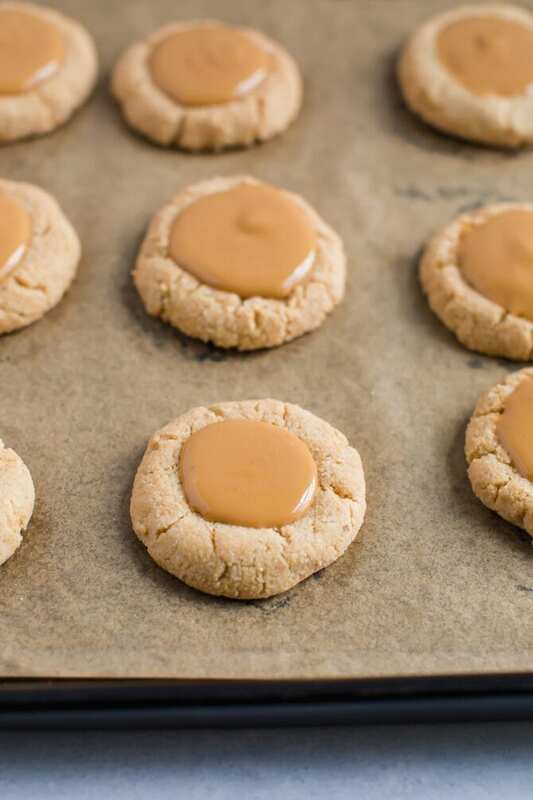 Once cookies have cooled, add 1/2-1 teaspoon of peanut butter into the dent of each cookie and spread it a little over the top. 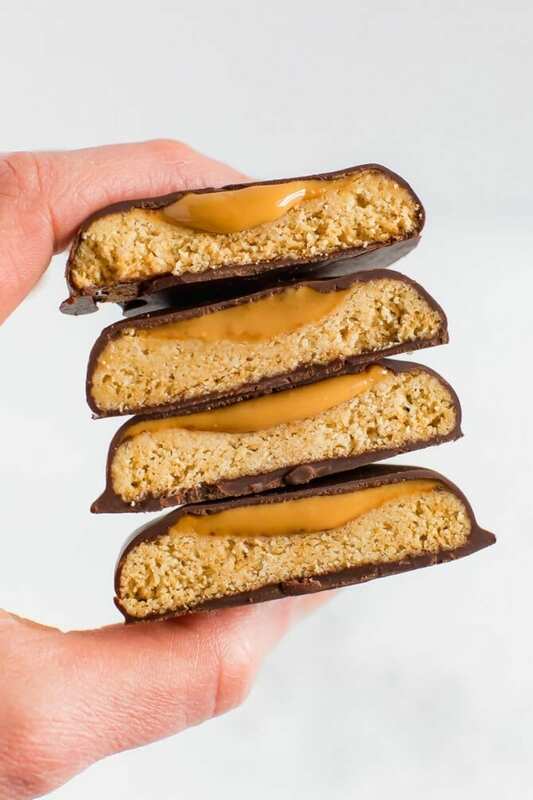 Place cookies in the fridge or freezer for about 15-30 minutes to let the peanut butter harden up a bit. Melt chocolate chips and coconut oil in double boiler or in the microwave. For the microwave method, add chips and coconut oil to a microwave safe bowl and heat for 1 minute, stir and heat in 30 second increments until chocolate has melted. The peanut butter should be chilled at this point so you can remove cookies from the fridge/freezer and dip each into the melted chocolate, one by one. Use a fork to dip and remove the cookie from the chocolate, making sure to let the excess chocolate drip off before transferring back to the baking sheet lined with parchment. Place chocolate covered cookies in the fridge or freezer for about 15-20 minutes to let chocolate set. Enjoy right away and store any leftovers in the fridge until ready to eat. My husband and I love the thin mint cookies. 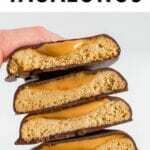 Looking for to trying the peanut butter tagalongs. Thank you for the fabulous recipes that you so generously share. Is the nutrition estimate correct for 1 cookie? I’m looking at a box of original Girl Scout Tagalongs and they are 140 calories, 8g sugar, 9g fat and 2g protein for 2 cookies. that they can make it themselves.Love it!! !